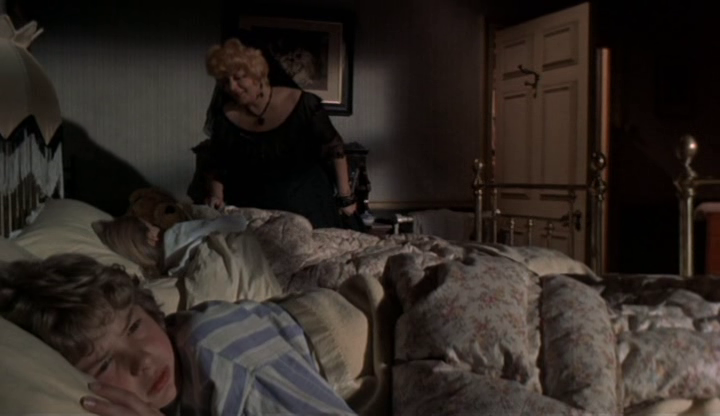 A demented widow (Shelly Winters) whose young daughter died in an accident many years earlier entices a young orphan (Chloe Franks) to come live with her in her mansion — but Franks’ brother (Mark Lester) believes Winters is a witch, and is determined to rescue Franks (and himself) from her clutches. Following in the dubious footsteps of What’s the Matter With Helen? 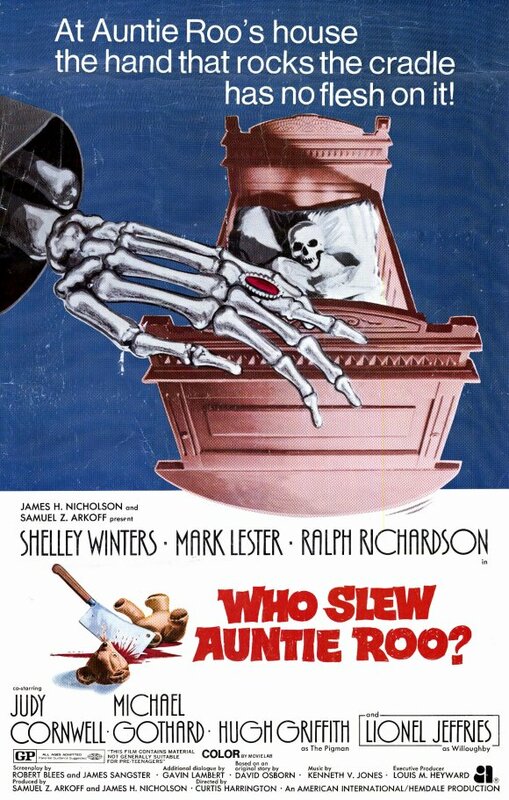 (1971), Who Slew Auntie Roo? inexplicably gives away a major spoiler in its very title — an inauspicious sign for what amounts to a disappointing entry in the Grande Dame Guignol (or “Psycho Biddy”) horror subgenre (kicked off by Robert Aldrich’s classic What Ever Happened to Baby Jane?). The primary problem with WSAR? is that Winters’ deeply troubled character is pitiable rather than fearful, given that we see early on how her daughter died in a tragic incident (rather than, say, being murdered); we therefore never really believe the two orphans are in serious danger. 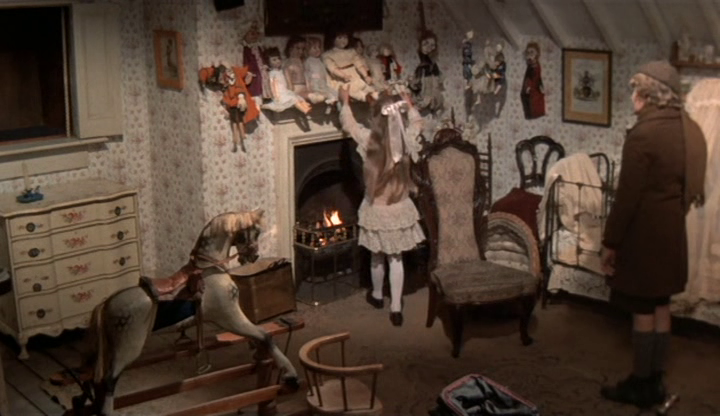 Instead, Lester — who apparently is convinced he’s trapped in the story “Hansel and Gretel” — emerges as the unlikely villain of the piece, convincing his sister that “Auntie Roo” is going to stuff them and eat them for dinner. Meanwhile, other plot elements — such as the presence of Winters’ manipulative butler (Michael Gothard) working in cahoots with a sham medium (Ralph Richardson) to convince Winters her daughter is communicating with her — are poorly resolved. Winters tries hard with the material she’s given, but this one is only must-see for her diehard fans. No; feel free to skip this one. Not a must. This is one confused mess. A late entry in the unfortunately labeled “hag film” series. All starts ominously enough with a shocking opener, followed by bombastic music for the credits. But thereafter things slow to a barely eventful, repetitive and talky crawl. The ‘tension’, such as it is, soon points to not much being afoot. The result – running off in various, desperate directions – is especially frustrating considering the casting of respectable British stars Richardson, Hugh Griffith, Lionel Jeffries and Pat Heywood; all sadly under-used. In the title role, Winters is on automatic pilot and strained. What promises to have cult value is a considerable yawn.